Also called a power supply unit or PSU, the component that supplies power to a computer. Most personal computers can be plugged into standard electrical outlets. The power supply then pulls the required amount of electricity and converts the AC current to DC current. It also regulates the voltage to eliminate spikes and surges common in most electrical systems. Not all power supplies, however, do an adequate voltage-regulation job, so a computer is always susceptible to large voltage fluctuations. Power supplies are rated in terms of the number of watts they generate. The more powerful the computer, the more watts it can provide to components. How can Sam test things without damaging his current computer or other hardware? Unplug the power supply from any of the components inside the computer (or just remove it from the computer completely). Plug the power supply into the wall. Find the big 24-ish pin connector that connects to the motherboard. 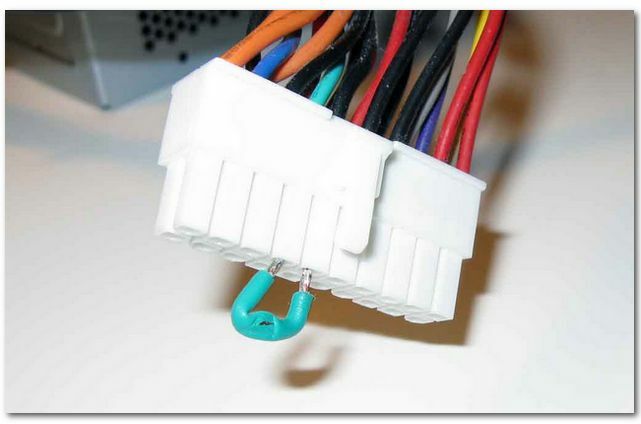 Connect the GREEN wire with the adjacent BLACK wire. The power supply’s fan should start up. If it doesn’t then it’s dead. If the fan starts up, then it could be the motherboard that’s dead. You can use a multimeter to check if there is power output from the power supply. Most well-stocked geek-stores sell a “power-supply tester” that has all the appropriate connectors to plug each part of your PSU into, with spiffy LEDs indicating status of the various rails, connectors for IDE/SATA/floppy power cables, etc. They run ~$20 US.